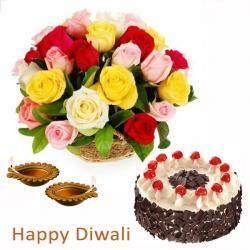 Product Consist : Diwali Greeting Card (Worth Rs 50/-)along with Vase Arrangement of 20 Mix Colourful Roses. The Flowers is a great gift for any festival or occasion. On this Diwali Send this florals with a Peace and Prosperity wishes for a good fortune and positive outcomes to your special recipient. This beautiful glass vase will make an excellent look of the home or office at this festive. For a delightful gift that makes anyones heart melt, this is the perfect hamper. 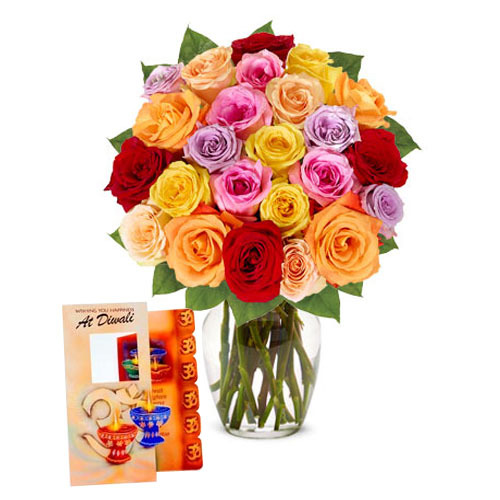 The attractive.Roses in different and natural colours are put together in a tied to form a superb glass vase. It looks marvelous with bright colours of pink, yellow and red very artistically arranged. 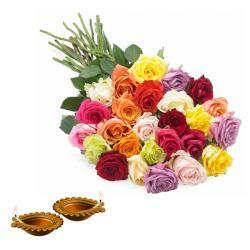 These Roses will make a beautiful memory of your gift and make your dear ones cherish it always. 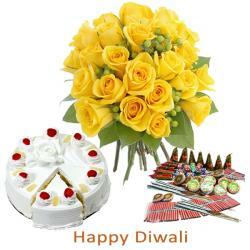 Also diwali greeting card it is set to touch hearts of your loved ones with warmth of your love. 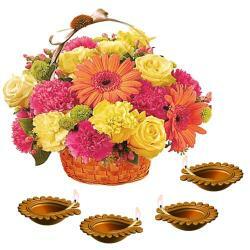 Product Includes : Diwali Greeting Card (Worth Rs 50/-)along with Vase Arrangement of 20 Mix Colourful Roses.